Bipasha Basu, Farah Khan, Farhan and Zoya Akhtar, Sajid Khan, Esha Gupta. 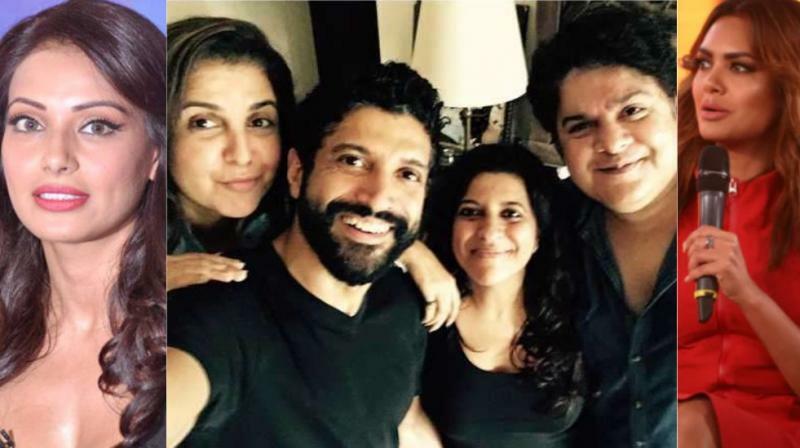 Mumbai: Farah Khan Friday said the sexual harassment allegations against her filmmaker-brother Sajid Khan are "heartbreaking". Sajid was accused of sexual harassment by two women, actor Saloni Chopra and a journalist. Bipasha Basu, who was directed by Sajid in ‘Humshakals’, didn’t face the same kind of harassment as the two women had, but she had her fair share of issues with him. "I am glad that women are speaking up about the atrocities of these men with power and clout... But nothing of that sort happened with me... It was just his general attitude towards women that would disturb me on set- he cracked lewd jokes openly and was pretty rude to all girls. Thank you. I have a voice and it’s important that all women find their voice and try to put an end to atrocities like this. Another member of the ‘Humshakals’ team, Esha Gupta echoes Bipasha’s views. "I mean not such harassment but there were incidents where he and I got into arguments, but as I said, even if it is just a statement, or just like abusing, that is also harassing a person. Like I said, only outsiders will know this. The insiders [stars kids] don’t go through this. The so-called nepotism kids say, 'Oh, we also have to go through it’. No, you don’t have to go through it, but we [outsiders] have to,” Esha told Cinestaan.com. With more and more accusations and not just an isolated case, it seems #TimesUp for Sajid Khan.